Since forming six years ago, Brighton based production duo Prok & Fitch’s DJ sets are becoming extremely popular. Their productions boast a multitude of DJs and producers, having worked with Kraak & Smaak, Todd Terry, Roger Sanchez, Laidback Luke and Moby, with their tracks gaining support from DJs such as Mark Knight, Axwell, Carl Cox and Fedde le Grand. Tipped as one of Toolroom's "future stars", Prok & Fitch return to the label with their Toolroom Knights mix, featuring peak-time house with warm, rolling basslines, rock solid rhythms and vocals. The mix contains the works of Mark Knight, Tom Staar, Kraak & Smaak, Jay Lumen, Adrian Hour and showcasing 10 exclusive tracks from the musical workings of My Digital Enemy, Ruben Mandolini, Filthy Rich & Prok & Fitch. 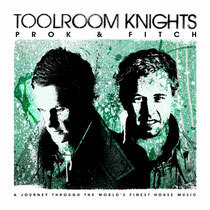 With 30 tunes in total spanning a multitude of genres, 'Toolroom Knights Mixed By Prok & Fitch' is a true reflection of the duo's sound and creativeness. It’s out now, check the video below for a taster.